Plants dark red to blackish, erect, up to 20 cm tall, comprising somewhat tangled bushy mass of ligulate branches with dentate margins. Attached by discoid holdfast. Erect axes 0.5 – 1 mm wide, irregularly branched; marginal teeth (determinate branchlets) about 0.6 mm long, opposite, curved towards branch apex, bearing sharp dorsal spine about 100 µm long. Central axial filament surrounded by 6 pericentral cells, medulla of up to 5 cell layers and cortex of 2-3 layers; proximal axes with secondary cortication; trichoblasts at apices of branches and marginal teeth, dichotomously branched. Tetrasporangia in lanceolate stichidia borne near apices of marginal teeth. Sexual plants not known. Subtidal, recorded from Dwesa along the whole KwaZulu-Natal coast (44-58). Worldwide distribution: South African endemic. 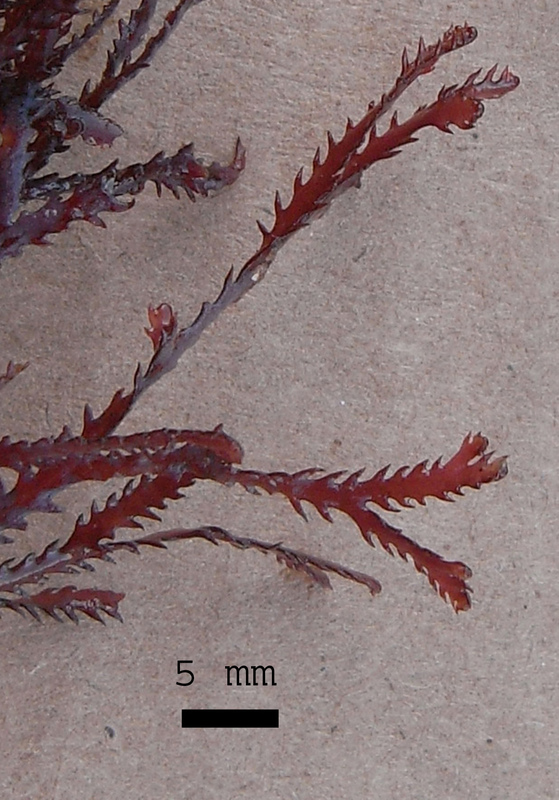 Type locality: Port Natal (Durban), South Africa (Silva et al. 1996). Note: previously known as Plectrophora natalensis (J. Agardh) Wilson & Kraft (2000). Henderson, R.J.F., Wilson, S.M. & Kraft, G.T. 2001. Kentrophora S.M. 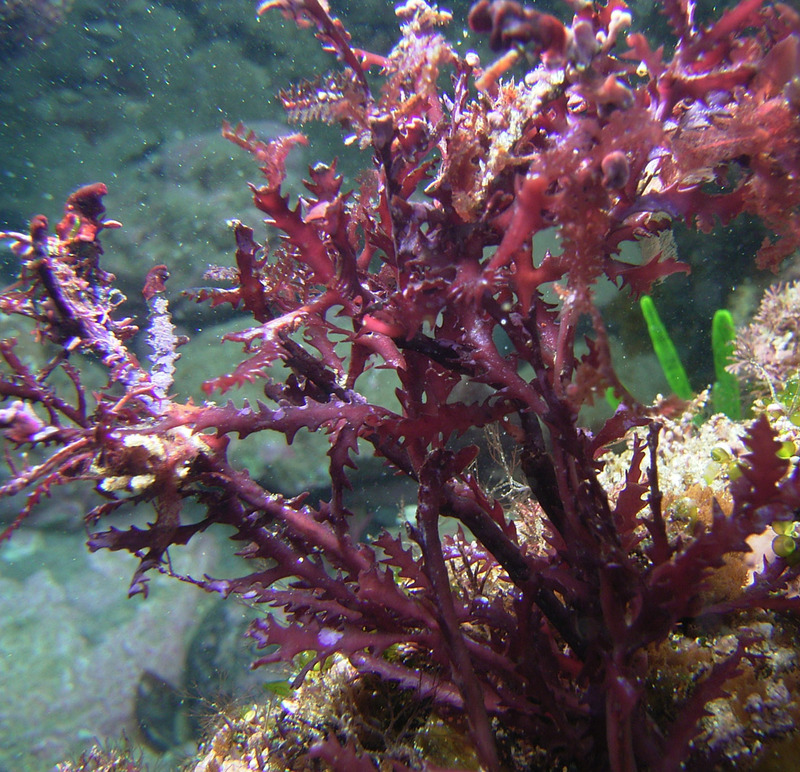 Wilson & Kraft, a new name for an algal genus in tribe Amansieae (Rhodomelaceae, Rhodophyceae). Austrobaileya 6: 175-176. Wilson, S.M. & Kraft, G.T. 2000. 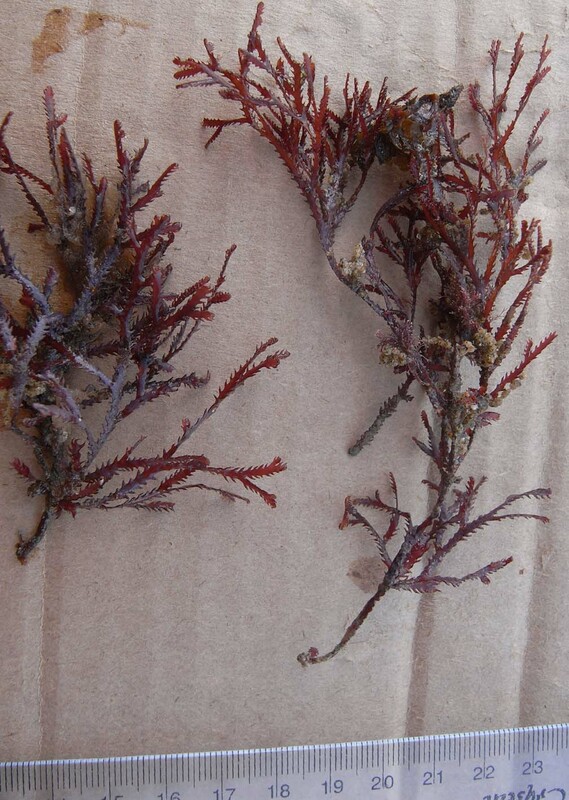 Morphological and taxonomic studies of selected genera from the tribe Amansieae (Rhodomelaceae, Rhodophyta). Australian Systematic Botany 13: 325-372.